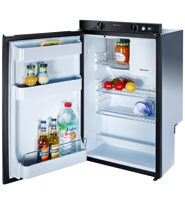 The new 5 series fridges by Dometic are compact classics featuring contemporary looks and they come in two different heights. 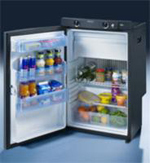 The new RM5310 fridge from Dometics new range features contemporary looks with an illuminated interior in ice-blue. 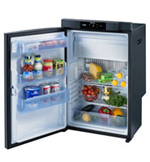 It features a seperate freezer compartment, battery-powered ignition system and thermostat regulation in 230-volt and gas mode. It combines individual usage with modern product design. 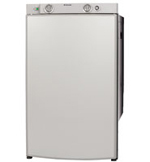 Innovative form and colour elements create the aesthetics of a high-quality household appliance. A unique furniture feeling is achieved by big decor surfaces. 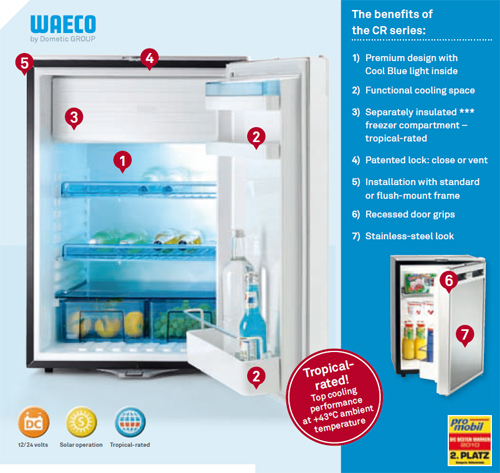 Inside the fridges offer a pleasant ice blue look and energy-saving LED-illumination. Battery ignition. The gas is ignited by pressing a button. (Piezo / model ending 0). Manual Energy Selector (MES). Simply turn the controls to select the energy source. (MES / model ending 1). Automatic Energy Selection (AES). Selects the best energy source automatically. (AES / model ending 5). 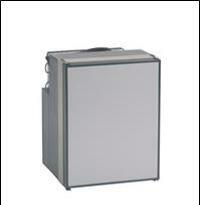 Most compact model Thetford absorption refrigerator. This refrigerator with manual ignition can even work using only gas – without being connected to electricity. If you select gas for manual ignition you press the ignition button until the flame appears. The modern way to cool. The Premium LCD line is equipped with all modern conveniences: LCD display, modern appearance and user-friendly features. The unique LCD display indicates the fridge temperature you have entered. You can also easily check the selected energy source. Should a failure occur, the error code for the specific problem is displayed on the control panel. By means of a numeric code you can refer to the manual to discover what the problem is and how to correct it. 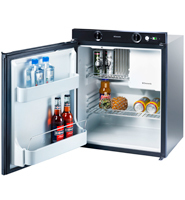 Also, the Premium line refrigerators are equipped with an automatic defrost cycle. This prevents ice collecting on the freezer element. This means that manual defrosting is unnecessary. 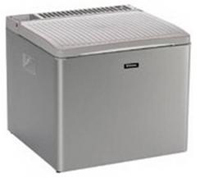 YOU WANT TO SWITCH FROM A PRE-INSTALLED ABSORPTION UNIT TO A COMPRESSOR FRIDGE? The Waeco Coolmatic MDC appliances are the perfect fit - their exterior dimensions correspond exactly to those of common absorption units. And at identical dimensions, they even provide a substantially higher usable volume. Featuring tried and tested compressor technology, they achieve outstanding cooling performance - even at extreme ambient temperatures and in an inclined position. They run silently, are incredibly energy efficient and are ideally suited for operation with a solar unit. 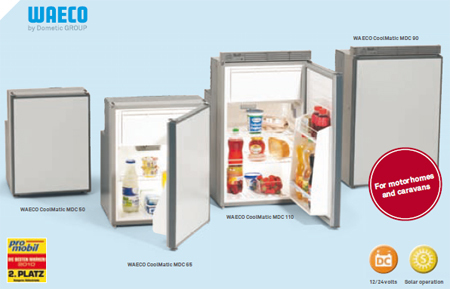 The interior of the Waeco Coolmatic MDC refridgerators wastes not a single millimetre of space. 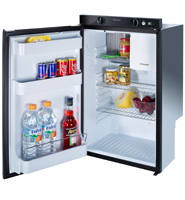 Despite the compact exterior dimensions, all models provide spacious freezer compartments and door trays as well as vertical space for 1.5 litre bottles. All interior shelves are adjustable in height and have a retaining bar at the front edge. A special fixing device makes sure that they stay firmly in place in all situations. Fold-up sections in the shelves provide additional room for large bottles or bulky items. System: Fully hermetic Danfoss BD35F compressor with integrated control electronics, low voltage protection, electronic fuse/automatic reverse pole protection, dynamically ventilated wire tube condenser, mechanical, continuously variable thermostat. Material: Stainless steel fittings and decor panel, plastic interior, door frame chrome-plated, body with coated metal frame or stainless stell fittings, plastic interior, plastic door frame, body with coated metal frame. Colour: Body = black. Door frame = chrome. Decor panel = brushed stainles steel or Body = black. Door frame = silver. Door panel = matt silver with a brushed stainless steel appearance. 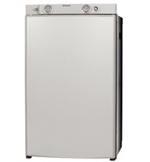 Quality features: Interior Light, door with magnetic seal, variable door mounts and locks (right/left), door with double lock (top/bottom) and dual function (locking/ventilation). 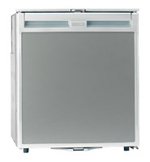 Seperately insulated freezer compartment, additional foamed rear-wall evapourator in the interior, easy to change door panel. Built to last and offer high performance at great value. Whether for camping or when just out in the countryside for the day, keeping food and drink chilled is a basic luxury and with a wide selection available, we have something for all occasions. 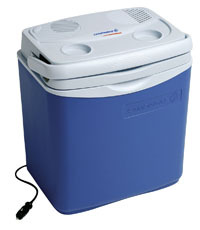 The Campingaz® Powerbox® range has a cooler to suit every occasion. The thermo-electric capability provides active cooling and some models even heat up to 65°C. The long cable length allows the cooler to be placed in the back of the car. 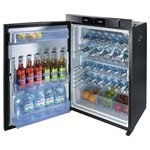 Cooling to 16°C below the ambient temperature, it is great to keep drinks and food cool. 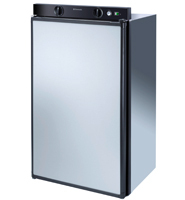 The Powerbox® 28L Deluxe not only cools to 16°C below the ambient temperature but it also heats to 65°C. An additional lightweight lid is also provided for extra convenience. 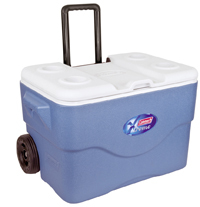 Coolers are an essential part of every summer, perfect for day trips and picnics. 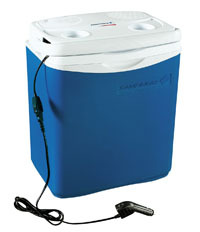 On a camping or fishing trip, at a barbecue or on the beach, coolers are an essential element of summer living. Coleman® has an extensive range of high performance coolers to keep drinks and food cold, even when the weather gets hot. 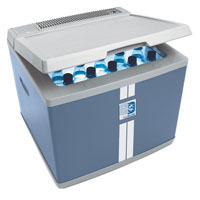 Coolers that provide superior cold retention thanks to their thick-wall, high performance PU insulation, you can keep ice cold for up to 5 days, even when temperatures soar as high as 32oC. 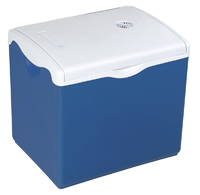 Perfect for a family at the campsite, these coolers are in it for the long haul and are also ideal companions should a party run a little longer than intended! 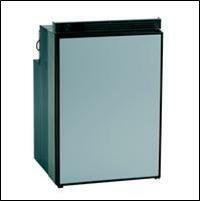 Large capacity thermo-electric cooler which can be used vertically or horizontally, perfect for families or groups. 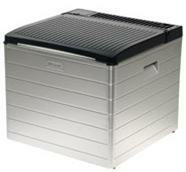 Dometic B40 Thermoelectric / Compressor Cooler is two cooling systems in one box. A compressor cooler for stationary and mobile use can be hard on your pocket - the new B40 won't! Designed as a typical portable awning cooler the B40 incorporates a powerful compressor as well as a thermoelectric cooling unit. 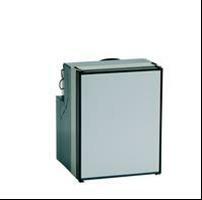 The thermoelectric system is used when the cooler is connected the 12-volt car battery. This ensures that the cool chain is maintained during transport from home to the campsite, cooling 20 degrees C below ambient temperature. When connected to the mains supply, either at home for pre-cooling or on the campsite hook-up, the B40 in compressor mode the provides cooling and deep-freezing up to -15 degrees C, even at high ambient temperatures, to make sure your goods stay cold in the hottest of summers! 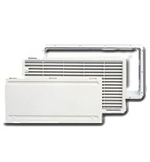 The ventillation system consists of a mouting frame, ventillation grille and a winter cover. 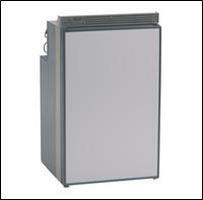 This cover only fits the MPK Fridge Vent 'recessed fit' and NOT the surface fit.